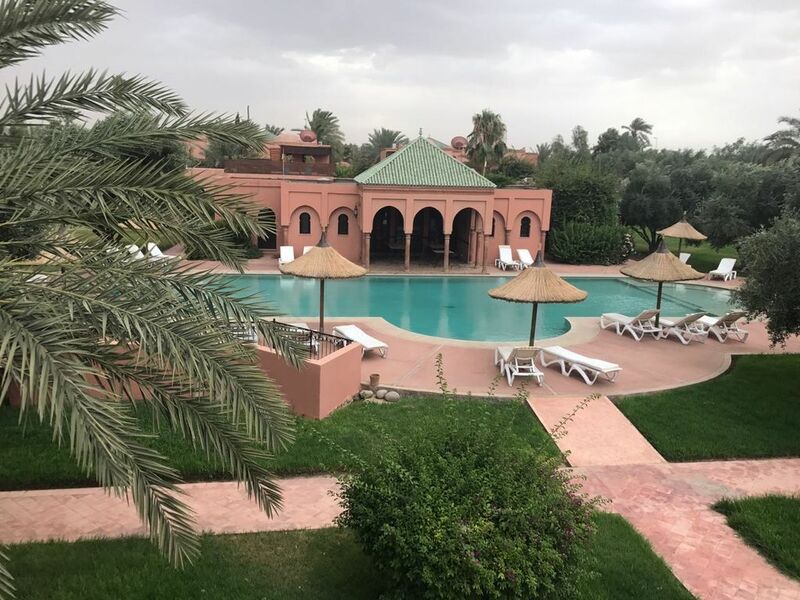 I propose to rent a beautiful villa type riad of more than 350m ² duplex completely redone (June-July 2018) in a secure residence located at the entrance of the Palmeraie. Located less than 10 minutes from Quarters Hivernage, Gueliz or the famous Jama El Fna square, you will find your happiness in absolute calm with greenery and palm trees. Enjoy the large communal pool by relaxing on the deckchairs and parasols at your disposal. Friend (s) golfers, many courses are located near the residence. The villa is equipped with 3 suites, each is air conditioned and has a private bathroom. - 4th guest toilet is also present. - 2 bedrooms on the ground floor overlooking the patio and overlooking the pool (common). - 1 bedroom upstairs with its beautiful terrace and pool view (common). - The kitchen is fully equipped (marble worktop, stove, oven, microwave, coffee maker, toaster, dishwasher, washing machine, etc.). - High chair and cot umbrella will be available if needed. The villa is equipped with 4 flat screen TVs and each bedroom has a safe to put your belongings safely. breakfast and lunch on request (extra charge - see directly with Karima on site). Hicham, our friend and employee of the residence will welcome you to give you the keys upon your arrival. to give you useful numbers when needed, such as "Green Taxi" for example. Finally, we will be able to give you good restaurant addresses to go out and spend pleasant evenings. I tell you that during your stay, breakfast will be offered. I also inform you that the tourist taxes are included in the price: no additional charge upon your arrival will be asked. Bella villa inserita in un piacevole contesto, vicina al centro ( 10 min di auto) , offre agli ospiti tutte le facilities che ci si possano aspettare da una casa vacanze. Alcuni particolari migliorabili, il proprietario ci sta lavorando. Personale di servizio disponibile e cortese. Senza dubbio una scelta da ripetere e da consigliare.